Broadcasting the archive was invited for a 6-weeks residency at The Luminary, St. Louis, MO (Oct 21st to Nov 30th 2015). For 6 weeks, I stayed in St. Louis, MO, where I was curator-in-residence at The Luminary. I spent most of my time engaging with the local art community, meeting artists, urban planners, curators and practitioners, mostly related with the Cherokee street area, as well as cultural producers developing projects all around the city. The aim of my visit was essentially to spread the AU archive as a tool for the local practitioners, to gather material about possible case studies to potentially add to the archive, and to record interviews with producers and users as well, for broadcasting. 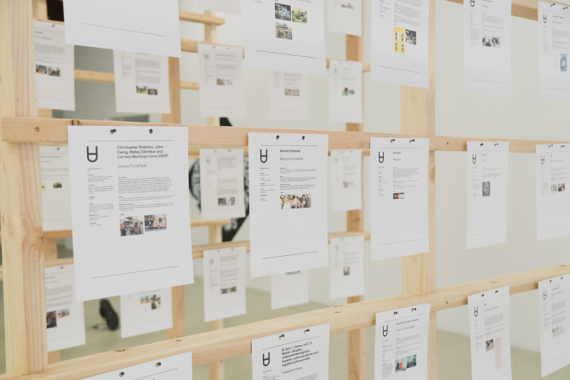 ‘Broadcasting the archive’ was included in the exhibition Sporadic Democracy – a culmination of a year-long exploration of how communities come together and fall apart, how public space is shaped, and wide-ranging experimentations with artistic forms appropriate to these questions. The exhibition was conceived as a cycle of actions, expansions and gathering points, containing independent but interrelated projects within a shared space. 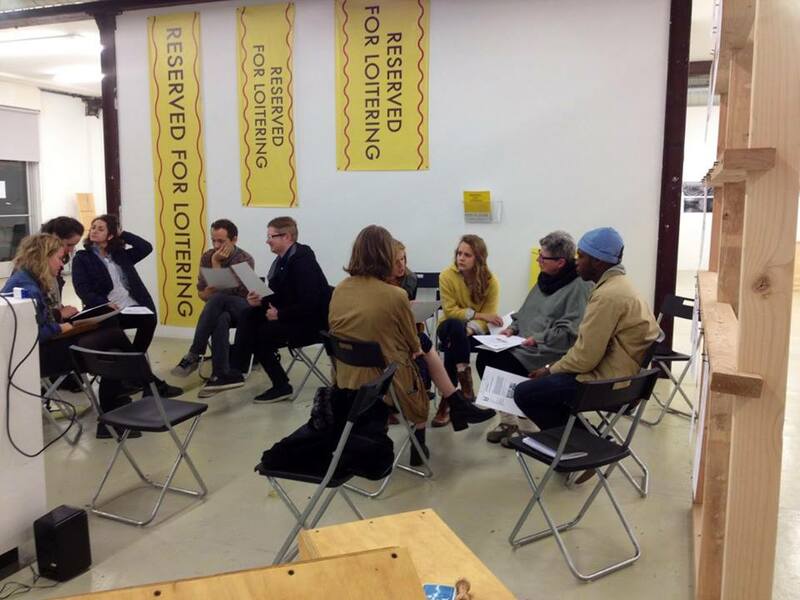 Thinking aboutthe context of St. Louis and its urgencies, we presented a selection of case studies dealing with the gentrification process, the use of public space as a ‘common good’ and alternative education systems implemented by artists. 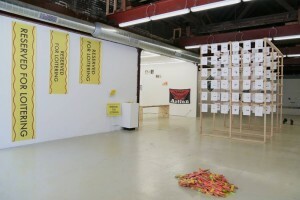 Broadcasting the Archive, installation view, The Luminary, St. Louis. Photo: Brea McAnally. 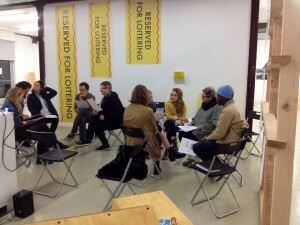 On the second week of the residency, I organised a 2-hour workshop around the Arte Útil Archive, in which 12 people took part, mostly with an artistic background and active in the local art context. The structure of the workshop was flexible in order to make participants feel comfortable and with a certain level of freedom to add elements to the activity. 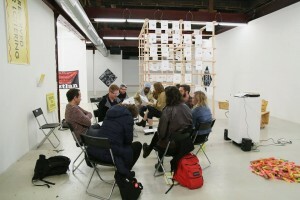 The participants were divided into 2 groups and after a 30-minute introduction about the project, they were asked to first discuss and analyse the criteria, and then to identify – among the 10 case studies I proposed – 1 or 2 more representative projects in the context of the Arte Útil movement. The discussion lasted between 30 and 40 minutes and each group selected just one case study. The final decision was debated collectively and accepted without any particular objection. During the last part – consisting of a 30-minute Q&A session – several questions arose from the workshop concerning the aim of the activity and its value. One of the most discussed aspects was whether the workshop is relevant either in a specific context or in an educational one. The archive is certainly seen as an important pedagogical tool that could be integrated in school programmes, giving students and professors an important resource for their research. Rather, the usability as well as the access to the archive for another kind of audience is still an unresolved issue emphasized by the question: what would happen if the archive were installed in a different context than the one of art? 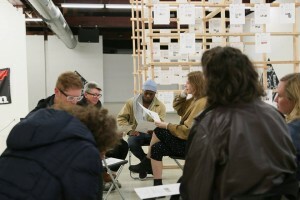 Another aspect that was widely discussed was the authorship both of the project and the case studies; the general feeling was that an artist would never replicate any of the projects, whereas the possibility to use case studies as inspiration was likely to happen by someone operating in another context i.e. civil servants, educators, teachers. In addition, the archive is seen as a project by Tania Bruguera even if I underlined its permeability, starting from the Lab at the Queens Museum, the Museum of Arte Útil and the most recent Broadcasting the archive. Questions: How can we use the archive differently? How to effectively emancipate usership? Which kind of activities could we add to the structure of the workshop? Right after the workshop, one of the participants expressed his gratitude for the activity asking for some links and saying that he will definitely use it for his own research. The day after, I received an email from another participant, Con Christeson, who is an artist and community organizer, running The Community CollabARTive, asking how the archive could be used in the context of the Community Arts Training (CAT) Institute. Over a span of 6 weeks, I met 14 people during open office hours at the Luminary where the archive was installed, through one to one meetings and studio visits as well. The people I met had different backgrounds, but more or less all of them were connected via the CAT Alumni Network. The presence of this programme has stimulated the growth of an art scene devoted to socially engaged practices, community art and cultural activism, helping to redefine the city’s identity through the arts. Various other initiatives dedicated to the impact of art in the city have existed since the beginning of the 2000s. For example, the St. Louis Public Art Consortium (STLPACK) is an organisation that groups ten different institutions such as the city council and the university among others, and whose mission is to promote public art and public art education in the St. Louis region. They produced a Curriculum Kit dedicated to teachers and students featuring public art works from the metro area; the kit includes slides, locator maps, posters, teaching suggestions and information about each artwork, and it is designed to encourage teachers and students to explore the public art works and develop a context for understanding them. Analysing the context of St. Louis, it is clear that it is a place where social tension is palpable, especially due to residential segregation and criminalization of the use of public space. St. Louis remains one of the most segregated cities in US with a visible dividing line between rich and poor along Delmar Boulevard, literally called the ‘Delmar divide’. In the blocks to the immediate north the population is 98% black, and in the blocks to the immediate south, it is 70% white. The differences are pretty evident, especially associated to the architecture; on one side of the divide you see Tudor homes, nice bars and lovely shops while on the other side you see collapsing and vacant houses, knocked-over street sings and trash on the side walk. Some practitioner I met are directly engaged in the #BlackLivesMatter movement or other forms of activism, which use art-based actions. One of their performative actions was supported by an artwork called ‘The Mirror Casket’. The piece was conceived collectively and it consists in a collaborative sculpture shaped like a closed coffin and made of mirrors. Officers would see their images reflected on it in order to question their own role in remedying the crisis of the innumerable deaths of black and brown people in the US. The casket was carried during several demonstrations in Ferguson following the shooting of Michael Brown in 2014. The coffin was sold to the Smithsonian Museum of American History in Washington this year after the museum requested it. The negotiation with the museum lasted 10 months and was hardly debated between the artivists who created the work. St. Louis has another big issue directly connected to the use – or better, the misuse – of public space: brick theft. The phenomenon goes back to the 1970’s; when large parts of neighbourhoods were left unwanted, thieves started to collect bricks to sell them for cash. After 2003, brick theft rose dramatically, to the point that entire buildings have been stolen. The city’s bricks are known for their good quality and are therefore prized by developers throughout the South of the country. Consequently, bricks are very easy to sell and they represent an easy profit for poor people. Artist and activist Juan W. Chàvez addressed the issue and after one year research in North Saint Louis, in collaboration with other groups and an arts foundation, began an intervention to regenerate a historic brick building in danger of being destroyed due to being vacant. After two years of restoration, the building became a community art space called ‘Northside workshop’ (NSW). NSW is a non-profit art space dedicated to addressing cultural and community issues in the Northern city. The project is linked to another initiative by Chàvez, ‘The Pruitt-Igoe Bee Sanctuary’ witch is already included in the AU archive (case study N. 426). The leitmotiv that links almost every practitioner in St. Louis is the level of negotiation between them and the institutions and consequently the level of sincerity of the latter is a relevant topic. The Luminary had a pivotal role in the research. Apart from being the independent institution hosting the project and offering space to organise the open office, it functioned as a mediator between the local constituencies and myself. 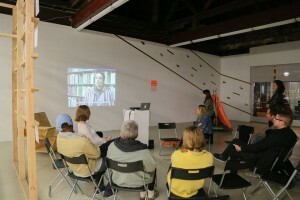 The Luminary is an extremely active art centre, located right in the middle of Cherokee street and presenting a rich programme of events, artists’ talk and presentations, concerts and workshops almost every week. Located in one of the most vibrant areas of St. Louis, it became a reference point for the art life of the city. I see a parallel between his words and what we have been trying to address through ‘Broadcasting the archive’; now that we have composed such an important series of tools, what could we do with it? How can we measure the impact that our practices can have, both on local communities and the way we see the world around us? How can we bring the case studies to the fore? Concerning the archive, after many conversations with CAT Alumni in St. Louis, the possibility emerged to include it as possible reference for schools programmes. The archive is seen as an important resource, which is alive and always up to date. Its porosity, easy accessibility and reproducibility renders the archive a real tool to approach the practice and to go deep into it, especially for students and practitioners who are approaching socially engaged practices. The fact that it is presented as a modular installation is an additional element toward its free interpretation and emancipation; it is clear that a design for the structure already exists, but it can be modified and adapted to different spatial circumstances like classrooms, gallery spaces, meeting rooms etc.